Choosing a place to live among the clutter of the city can be challenging. If you’re coming to live in Tainan, you will probably need to find a place to live. Some companies provide accommodation for their employees and some schools provide dorms for their students, but most people seem to be on their own in their search. The good news is that there is no shortage of empty apartments in the city. The bad news is that few of them are very nice, and searching for them without much knowledge of Chinese isn’t very easy. It can be very overwhelming at first, but keep heart. It’s not like there are dozens of foreigners wandering the streets of Tainan with no place to live. With a little courage you can get yourself on your feet, and with patience you might even find a good apartment. Hopefully, you will receive some help from your school or employer when you first arrive. If not, you could stay in a hotel, but even a budget hotel will start to get very expensive very fast for most people. 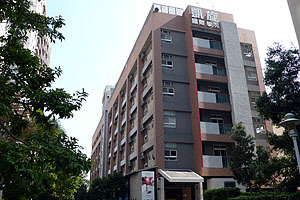 It is probably better to try a university dorm like the ones at NCKU, or a private dorm company. When I first arrived I went to a private dorm/business hotel called Paragon Inn International. I just walked in with my bags, passport, a two-month deposit and one month’s rent and then went straight to a room. Either of these options can give you a place to stay with little commitment until you find something more permanent. Search for ads on housing websites and/or hire an agent. Wander around and find it yourself. Expat bulletin boards like Tainan Bulletin and iTainan are very good ways for English speakers to get hooked up with an apartment. They are often handed down from other expats who have broken the language barrier already, or they are posted by English-speaking landlords. You can often buy furnishings from the departing expat which is an advantage if you like the furnishings and have the money, but a disadvantage if you don’t as the departing expat may only hand the lease over to someone who will buy his or her stuff. All-in-all the bulletin boards are the easiest way for English speakers to find housing, but the real problem with them is that postings are rare. You may only see two or three come up in a month. Keep an eye out for signs with the character for "rent" on it. There are many websites that have postings for apartments, but almost none of them have English interfaces. Some of the postings are handled directly by landlords and others are handled by agents who are adding more to cost. Either way, if you find one you like, you’ll most likely have to make contact using Chinese (yours or someone else’s). Browsing through ads is fairly easy and you can see pictures and price ranges. It’s not a bad place to start to see what’s out there, but it can also be disheartening when you look at picture after picture of dark, dirty, ugly places in the low range, or the endlessly tacky furnishings in high ranges. Hiring an agent can help but they don’t work for free. Some of them are paid by the landlord, and some by the landlord AND the tenant. Either way, the landlord will likely raise the price to offset the broker fees. Here are some websites you may want to try. Make sure you’re looking at 台南市 for Tainan City, and 出租 or 租屋 for rentals. They may also ask you to search by district: West Central 中西區, East東區, South南區, North 北區, Anping 安平區, and Annan 安南區. Heading out on your own and finding something you like may seem daunting, but I highly recommend doing this. 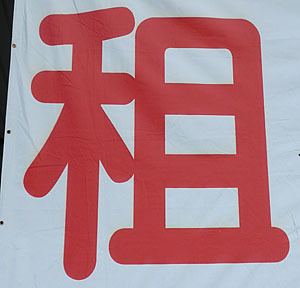 Just keep your eyes open for signs that say 租 or 出租 signaling the property is for rent. The characters will often be in red. Write down the phone number and then have someone help you contact the landlord. Or, if there’s an apartment building you think looks nice, you can simply walk in and ask the attendant if there’s an apartment available. You will likely avoid any fees and you can prioritize location this way. If you’re looking for very cheap housing, you could also try ads that are posted on bulletin boards around the universities. There are a large variety of price ranges in the city. Costs for apartments include rent, deposits, furnishings, building fees, and utilities. The cost of renting an apartment in Tainan varies widely based on location, size, and quality, so it’s difficult to get a price range to work with. 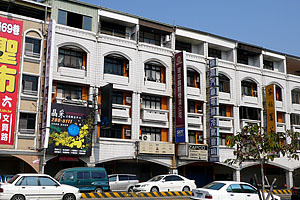 Tainan is not expensive for rent, relatively speaking. If you were to come here from Taipei, you would probably find rents about 30 – 50% cheaper. It is possible to get rooms for as low as NT$2000 per month, but you could also spend over NT$60,000 for a furnished penthouse. For a small, furnished one bedroom apartment in a modern building, you can expect to pay between NT$8000 to NT$12,000 as a ballpark figure. 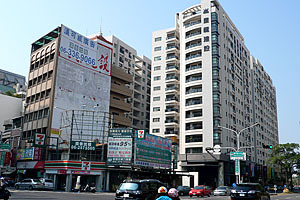 You could also get an unfurnished three bedroom apartment in an older building for about NT$8000. You will also need to pay a deposit. Deposits in Taiwan run from one to three month’s rent, with two months being the most typical. Your NT$8000 apartment will cost you NT$24,000 to move in. As standard, you will be refunded the deposit if you complete the lease and don’t damage the apartment, but no interest is given on deposits in Taiwan. Apartments come in every level of furnishing from nothing but doors and windows to fully-stocked cupboards and linen closets. Rents for apartments with nothing (no refrigerator, no air conditioner, no stove) are very cheap, but you will have to supply all of those things yourself. Consider how long you will stay in Taiwan and do the math. Building fees are generally added to larger apartment buildings that have doormen, custodians, and garbage services. The fees vary, but are often around NT$800 to NT$2000 depending on the building and sometimes on the size of your apartment versus others in the building. Smaller apartment buildings and houses may not have building fees, but cleaning up public areas may rarely get done and you’ll be spending your evenings waiting for the garbage truck. Check also for parking fees. Utilities are rarely included in the rent. Be prepared to pay your own water and power bills. Natural gas may be piped into newer apartments, but in older buildings you will have to order tanks of gas to meet your demand. Old and new apartments exist right next to each other. There are many things to consider in choosing an apartment including city location, orientation, furnishings and the age of the building. Most people will choose a location convenient to their work or school, or based on personal factors. Pricing for locations have their similarities and differences in Tainan compared with most Western countries. Centrality is important and neighborhoods have their general demographics, but there is nothing like a Champs d’Elysee or a Greenwich Village here. Upscale buildings and low income housing exist next to each other, and trendy shops and eateries are spread all over the place rather than being neighborhood dependent. Generally, the West Central District is the most expensive area and the farther you get from the center, the cheaper the rent generally becomes. However, things like being next to a good school, across from a park, or close to other conveniences all push the price up. Living close to the ocean, however, lowers the price as it’s seen as being inconvenient. Orientation of a unit in a building is important for comfort. 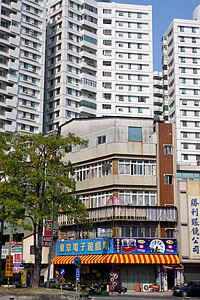 Most buildings in Taiwan, new or old, are poorly insulated. The cement can trap in either cold or heat, so most people either have a cold or hot apartment depending on its location and direction. Top floor apartments usually cook in the heat for most of the year. These apartments often have higher vacancies and cheaper rents for this reason (except for luxury penthouses). A north-facing apartment may be cooler in the summer, but feel cold and damp in the winter. The opposite may be true for south-facing apartments. You will probably need at least some furnishings already equipped in your apartment as unfurnished can mean no refrigerator or anything. With furnished apartments, remember that you’re probably stuck with the furniture that’s there. The quality may not be what you’d expect living elsewhere and your landlord may not pay for any repairs to that clunker of a fridge that stopped working two weeks after you moved in. Try out the furniture (especially the bed), inspect the appliances, and keep your fingers crossed for a good landlord. Landlords are technically responsible for structural upkeep, but many feel they are not responsible for replacing or repairing appliances and furnishings. Older buildings are cheaper and a few even have character, but you’ll need to check to see if the wiring and plumbing will meet your needs. Many have not been upgraded to meet modern demands on electricity. Check to see if there are enough electrical sockets to support major appliances as well as electrical devices. It is unlikely you’ll be able to flush toilet paper in an older building. Townhouses like these are often available to rent, but detached houses are becoming scarce in the city and are almost never for rent. Once you’ve decided on an apartment, you will probably have to sign a lease. Leases are usually either for six months or a year, though some leases near universities follow the academic season. An English/Chinese version of a standard lease is available at Tsuei Ma Ma website. It is reasonable to ask to see the owners ID card and ownership statement for the premises to make sure he or she does indeed own the place. Also, get a copy of the owners ID and in exchange you will probably be asked for a copy of your ID (ARC card or passport). Once the lease is signed, both parties should have a copy. Your lease will likely be a red booklet and you should keep this in a safe place. Subleasing is not allowed unless clearly stated by the landlord. Check for limitations on the lease such as no cooking or no pets. Ask the landlord what they will be responsible for in terms of repairs and maintenance. Take photographs to document the condition of the building and its furnishings when you move in, especially if there’s damage. If you have any problems with housing, you can contact the Tainan Foreigner Assistance Center at Tainan City Hall or the Information for Foreigners service (0800-024-111). They can assist you with problems you are facing and may even be able to help set up appointments with landlords. I guess that link is dead now. The address is #18 Lane 118 Dongxing Road, East District, Tainan City. So, look for 118 on Dongxing Road, tucked back a little from some fancy skyrises. Sorry, I don’t have the phone number. Do you have an address or contact info for Paragon Inn? I have been trying to search for it and it isn’t showing up in any of my searches. Thanks for the quality info, keep it coming. Of course beautiful building with well attraction.Before choosing you ’ll need to check to see if the wiring and plumbing will meet your needs. Many have not been upgraded to meet modern demands on electricity. Check to see if there are enough electrical sockets to support major appliances as well as electrical devices. It is unlikely you’ll be able to flush toilet paper in an older building.Thanks for beautiful share. I think The Paragon still operates the same as it always has. I saw the guy who was the manager when I lived there going into the building a couple of weeks ago. I find a lot of websites in Taiwan end up with broken links. Websites aren’t well managed here. It used to be NT$6000 per month. One thing though: students are returning to university right now, so you may find places like the Paragon are reluctant to do short stays when they think they can get a nine month commitment from a student. Can anyone recommend a good professional housing agent to assist me in finding an upscale apartment near NCKU? I suggest you contact a housing agent. Hello! I am moving to Tainan for 6 months. Is it possible to find an apt somewhere near by the sea? Which area could it be? To be closest to the sea, you should look in Anping district. There’s not really development along the waterfront, though, so don’t expect to be right on the water. Thank you for an advice ! I am planing to study in NCKU. Can you please give me a hint how or where I can find a nice and clean apartment with 1 bed room? I am searching and all sites are in Chinese! I am evaluating to see if 25000 NTS/Month is enough for a couple or not. This may affect my decision.